Dr. David Albin of the Southern California Hernia Center explains the inconsistencies inherent to medical costs in America and offers more transparent pricing for hernia surgery at his eight practice locations. Los Angeles, CA — A hernia is a condition in which an organ pushes through an opening or tear in the soft tissue covering it, usually in the abdomen but also potentially in the groin, belly button, or upper thigh. 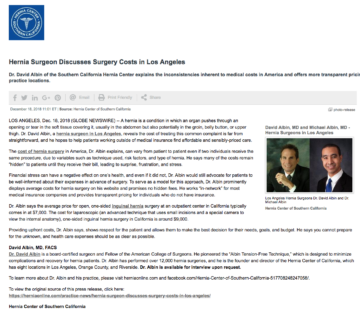 Dr. David Albin, a hernia surgeon in Los Angeles, reveals the cost of treating this common complaint is far from straightforward, and he hopes to help patients working outside of medical insurance find affordable and sensibly-priced care. The cost of hernia surgery in America, Dr. Albin explains, can vary from patient to patient even if two individuals receive the same procedure, due to variables such as technique used, risk factors, and type of hernia. He says many of the costs remain “hidden” to patients until they receive their bill, leading to surprise, frustration, and stress. Financial stress can have a negative effect on one’s health, and even if it did not, Dr. Albin would still advocate for patients to be well-informed about their expenses in advance of surgery. To serve as a model for this approach, Dr. Albin prominently displays average costs for hernia surgery on his website and promises no hidden fees. He works “in-network” for most medical insurance companies and provides transparent pricing for individuals who do not have insurance. Dr. Albin says the average price for open, one-sided inguinal hernia surgery at an outpatient center in California typically comes in at $7,000. The cost for laparoscopic (an advanced technique that uses small incisions and a special camera to view the internal anatomy), one-sided inguinal hernia surgery in California is around $9,000. Providing upfront costs, Dr. Albin says, shows respect for the patient and allows them to make the best decision for their needs, goals, and budget. He says you cannot prepare for the unknown, and health care expenses should be as clear as possible. Dr. David Albin is a board-certified surgeon and Fellow of the American College of Surgeons. He pioneered the “Albin Tension-Free Technique,” which is designed to minimize complications and recovery for hernia patients. Dr. Albin has performed over 12,000 hernia surgeries, and he is the founder and director of the Hernia Center of California, which has eight locations in Los Angeles, Orange County, and Riverside. Dr. Albin is available for interview upon request. To learn more about Dr. Albin and his practice, please visit herniaonline.com and their facebook page.